LaserDisc Database • View topic - New SACD titles barely available from Amazon.com anymore? New SACD titles barely available from Amazon.com anymore? Post subject: New SACD titles barely available from Amazon.com anymore? I have been buying SACDs from Amazon for years but recently all the new titles just aren't listed anymore. Did Amazon give up on SACDs? It would appear so unfortunately. In the end I solved the problem by moving all my SACD business to elusivedisc.com. Not only do they have a bigger SACD inventory, they're also less expensive than Amazon. They also stock all the other SACD publishers. Thanks for the recommendation, Julien, I'll check them out. Sure do. After ordering, Elusive's Angela Clymer from the order department has been very helpful to split shipments and apply discounts. So far, no issue. Good packing as well! I don’t really follow these threads or the state of SACD but it seems like it’s dying off from these posts I read. I thought I’d mention Acoustic Sounds in the US who sells lots of SACDs and makes their own and seemed to be saying they were making more not less when they sent me a catalog not too long ago. It seems that they have a bit of the same problem as vinyl pressing these days: not enough production to meet demand. I believe there are only 2 factories manufacturing SACDs these days: one in Germany (Sonopress? ), one in Japan (SONY). They raised the price for manufacturing SACDs in Japan last year, switching to SHM-SACD only often without red book layer (non-hybrid). Hendrix's Axis - Bold as Love got released on time but the "Are You Experienced" got delayed several times. The competition was briefly "Hi-Res Audio BluRay" (audio only discs) and now one can simply purchase/download the DSD/DSF files online and play with through a DSD-capable DAC. I've ripped all my SACDs and just play them from a HDD connected via USB to my OPPO player. Yeah, I’ve been downloading high res stuff in DSD or FLAC or sometimes even ALAC. Actual SACDs are just to much of a hassle to get. 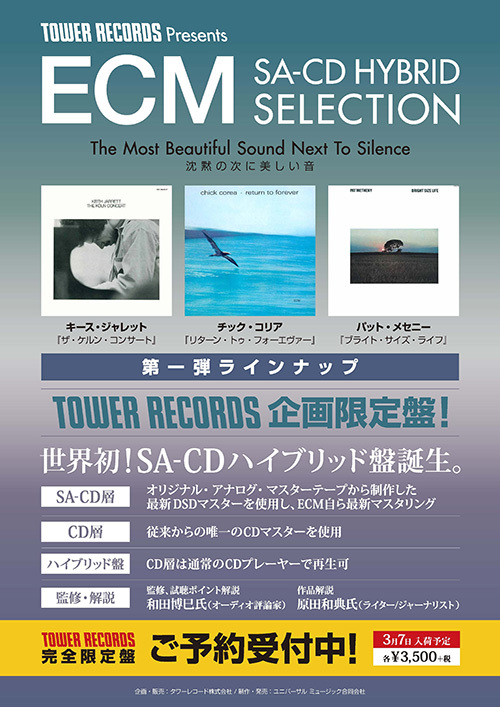 Looks like the ECM releases in Japan are over. Most have been released before either in SACD or BD Audio, it's not as exciting as the ECM ones.